The following article originated as a posting to FIDDLE-L, a mailing list dedicated to the study of fiddling in America. I found that it addressed many questions I had had about participation by black musicians in country, blues, old time and bluegrass musics, and asked Tony for permission to publish it here. I would like to thank Tony for letting me print his revised version, and would welcome any comments others might have concerning this topic. Our Bluegrass Blog (try saying that ten times in a row!) is available 24 hours a day. Many unfamiliar with the real history of Black fiddling forget that fiddling was extremely common among African Americans until the early 20th Century. In the we have many reports of Africans in America fiddling and making fiddles almost as soon as they arrived from Africa. The excellence of Black fiddlers performing both for white masters, patrons, and paying audience and for the dances and parties of other Africans in America, speaks not only to the training in European violin playing some slaves received, but also to traditions of fiddling on African bowed instruments that slaves brought here. No wonder, fiddling was the most reported musical activity of African Americans during colonial times. Studies, particularly Bob Winans' survey of instruments mentioned in the WPA interviews of former slaves, show that fiddling was the most widely known instrumental music in Black folk life in the 19th Century. Yet, today there is relatively little knowledge in the Black community, let alone appreciation of traditional Black fiddling. As far as anyone knows, Joe Thompson of Mebane North Carolina remains the last traditional African American fiddler, though a small group of younger African Americans like Earl White, Rique Prince, Rhiannon Giddens, and Justin Robinson are trying to continue the tradition in revivalist bands. 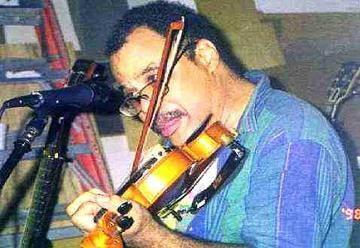 What happened to all the Black fiddling? Why does it not continue as white fiddling has in revivals of old time music, in Country music, and in Bluegrass? To find out about what happened to African American fiddling we need not only to regard what has happened to white fiddlers, but to look at the real dynamics of Black cultural and social life. Very much of existing white fiddling is part of the folk revival and its descendants, mutants, and extensions, something I am proud to be part of. More of it is part of modern country music and Bluegrass, where fiddling survives as a real living music. In country and bluegrass part of the rubric--although these are actually innovative and progressive musics in their own ways--is the claim that the music looks back to old rural Southern traditions and involves what Big Mon called "ancient tones." I've been to C/W concerts where I've overhead audience members decrying groups that are hat-act light rockers with southern accents, hoping that the next act "has a fiddle in the band." To these fans, a fiddle meant a continuity with Country music's links to the rural Southern music of the past..
African American mass culture, at least in the 20th century, seems to share none of this desire to look backward and identify with "the good old days." Perhaps that is because for us, the old days were not very good. I grew up knowing relatives whose parents had been slaves. Nostalgia for the past seems not to be a major part of Black general culture, especially musical culture. This is especially true in regard to aspects of culture that symbolize the Southern rural past, the other racial side of the past that Country music and old time music folk look to. Moreover, the changes in Afro-America have been tremendous. When I was born in 1947, even though there had been significant migration to the Northern and Western industrial cities during World War II, most African Americans were involved in Southern agriculture. Today, African Americans are the most urbanized folk in the country. In fact, today the term "urban" in music, dress, and other things now seems a synonym for "Black." I am not saying that for people who are not Black, the past is a rose garden, or a nice thing, or is represented correctly in the nostalgic media. That past was not. However, a different reaction about this rural past exists in Black musical and general culture than what seems to be the case in the dominant culture. Many observers of Black musical culture have likened it to some schemas of how a cultural vanguard (this is not to say that Black music is some kind of vanguard). An important and dynamic aspect of Black music battles against the dominant culture's attempts to contain, homogenize, and redefine the different waves of Black musical expression and blend it down to being acceptable to the dominant culture. African American music makers and their audience (the significant group both among creators and consumers being young hormone rich folks who love to dance) tend to move on to something new, authentic, and something that has not yet been captured by the dominant culture. They seek something that expresses, not the dominant experience, but their own experience and identity. Rather than much identification with anything that harkens to the past, that culture tends to wish to create newer "Blacker" forms of expression that folks vainly hope will not become contained, or adulterated by the dominant culture. This means that there is almost no orientation to going back to the old music, or trying to identify with "ancient tones." There is no strong attempt to identify with rural roots or the past of the Jim Crow rural South. There is simply no counterpart in Black mass musical culture to revivalist folk music, country music, and bluegrass music's attempts to identify with older musics and older life. None of their musical revivals ranging from those of Dixieland after WWII to the more recent "Swing" revival have had any reflection in African American musical culture and there have been no parallel separate revivalisms among African Americans either. This includes the attempts by a faction of Black Jazz musicians to model Jazz performance and practice on the models of Classical Music (some even distain the term, "Jazz ," and speak of "Black Classical Music"). They have created orchestras who perform Jazz classics from the past, much as symphony repeat the classical standards. My attendance as some of a great concert of the Jazz Orchestra of Lincoln Marsalis redoing the classics of Black swing music, was similar to attending folk concerts and events. Very few Black folk were there. Some Blacks see these revivals as attempts to get away from African American based music of the present or to recast older Black musics in white versions. As an African American who writes about and performs old time music and blues, I regularly receive letters from white persons who counterpose "the Black cultural heritage" of Blues or Black string band music to the "bad " hip hop and rap. Such white folks ignore the fact that the current musics created by the young and African American exist precisely as a continuation of musical traditions of blues and black string band music, and that the purpose of culture is to express the real identity and living conditions of people, so that they should expect Black folks, particularly the young, the poor, and the alienated to create music that speaks of their own separateness, and not the tastes of the non-white, non-young, and non-Ghetto population. Those of us interested in performing traditional African American music of the past, are usually condemned to performing for largely non-Black audiences. African American folk fiddling disappears as part of this cycle. Black fiddling was fairly popular in the 19th century and in the early part of the 20th Century when string band playing and dancing were dominant in rural Black communities. Even when the blues and its own dancing replaced the older music starting at the turning of the century, fiddles, unlike five-string banjos, tended to be included in blues bands, and to accompany solo blues artists on records. Yet, in the 1940s when blues bands went from being acoustic band to electric, with the exception of a great few, Black popular fiddling disappears. In the subsequent years there has been no tendency to want to go back or at least pretend to go back to a rural Southern past, by retaining fiddles or banjos for that matter. There is a similar relationship between the Black R & B that went electric in the 1940s and older Black rural musics with fiddles that preceded R & B as there is between, older white musics and Western Swing and "Country" bands that went electric and older acoustic Western and "Country". None of the Black bands reach back to rural roots by retaining fiddles or banjos as the Western and Country bands have. I stress that this is not a moral or some other kind of valuation of African American culture as being superior to white culture. It is just different. Tony Thomas is the list owner of Black Banjo Then and Now (on Yahoo at http://launch.groups.yahoo.com/group/BlackBanjo/ ). He was convenor of the Black Banjo Gathering at Appalachian State College in Boone, NC in April 2005. He plays old time music , blues, and folk music on the guitar, five-string banjo, and fiddle. His articles have appeared in the Old Time Herald and The Black Scholar. He lives in the Miami-Fort Lauderdale area of Florida and can be reached at radwriteluv@aol.com. Copyright 2007 by Tony Thomas, used by permission.